That is Jonathan Harvey talking about the future of classical music in an exclusive interview being broadcast and webcast on Future Radio on Sunday Sept 4. Which is the day after the composer's choral work Dum transisset sabbatum is being performed at a BBC Prom. 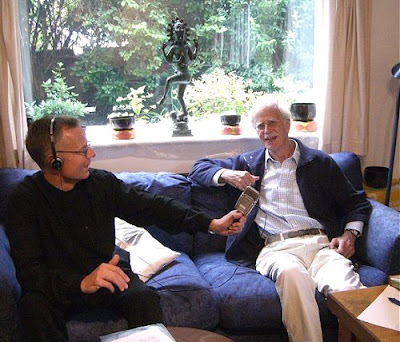 Jonathan Harvey is seen above talking to me at his home in Sussex during the recording. In the interview he talks about musicians he has known including Benjamin Britten, Hans Keller, Karlheinz Stockhausen, Milton Babbitt and Pierre Boulez. He also discusses his deep interest in mystical religions and the musical topics range from the future of classical music to serialism and spectralism. 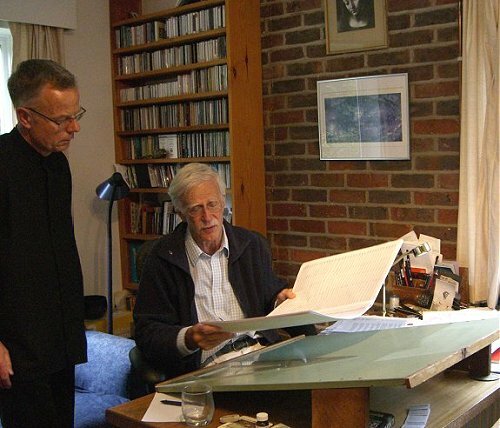 The interview concludes with Jonathan Harvey giving an invaluable introduction to his new composition for large orchestra and electronics, Speakings, and this is followed by a complete recorded performance of the work. There is some priceless material in the interview so it is being made available in several formats. The broadcast version is being aired on FM locally in Norwich, England and worldwide via the internet at 3.00pm UK time this Sunday Sept 5, with a repeat for North American listeners at 1.00am the following morning, i.e. the night of Sept 5-6. (Time zone convertor here.) This broadcast will be a 28 minute edited interview ending with Jonathan Harvey introducing a full performance of Speakings which lasts for another 28 minutes. A streamed version of the complete interview is now available on Soundcloud and a text transcription can be read On An Overgrown Path. Some background to the interview. is below. ** My thanks go to Jonathan Harvey for making time available before a demanding trip to Japan, and to John Cronin who helped set it up. The interview could not have happened without the tireless support of Future Radio; if you appreciate their backing please send them a message saying so. All my work for the station is done on a pro bono basis. The recording of Speakings is on a new Aeon CD of Jonathan Harvey's music recorded by the BBC Scottish Symphony Orchestra conducted by Ilan Volkov. Future Radio tell me that due to the exceptional level of interest in the Jonathan Harvey interview they are repeating it twice more; at 3.00pm on Sunday Sept 12 and 1.00am overnight Sept 12-13. Very pleasing for a programme that is 100% contemporary music. Jonathan Harvey wants to see "an atmosphere where people can come and go and even talk perhaps.. and certainly leave in the middle of a movement if they feel like it. Nobody should be deprived of classical music, least of all by silly conventions.'" When I go to a classical concert I want to listen to the music and not be disturbed by others' chatter or by the noise and distraction of people moving in and out. That people shouldn't talk in concerts and should stay put while the music is being played are not "silly conventions". Shame on Harvey for pandering to the lack of consideration for others which is so prevalent today. I never go to non-classical concerts just because people talk as though in their living-room at home, sing along, eat and drink, move about, get up and dance... And theatres are going that way, too. Harvey needs to watch his English, too. It is a gross misuse of "deprives" to say that someone is deprived of classical music if they won't go to concerts because they have to shut up while the music is playing. Paul, there are always two sides to any debate and I am happy to publish your view. But I would say that the quotes need to be placed in context by hearing the whole interview. Jonathan Harvey is talking specifically about reaching younger audiences. He is not proposing a wholesale change to the way concerts are presented. Surely his ideas follow on from Boulez's Roundhouse concerts in London and 'rug' concerts in New York? As above I am travelling so comment moderation may be delayed. (And I am just about to miss my flight!) But I am interested to learn what other readers think of Jonathan Harvey's ideas and Paul Brownsey's response. I'm with Brownsey. I take your point about context, but if the context makes that much difference, perhaps you could have published a somewhat more representative quote. As it stands, his commments about "silly conventions" just sound ... well, silly. Extremely valuable survey of all the "isms" he has studied in depth from serialism to spectralism, a wide ranging review of all the influences to which he has opened his exploratory mind and heart; should be published, but best heard in Harvey's own quiet, persuasive voice. I'm glad to have run across this post (and blog for that matter). I had seen a Guardian article that contains parts of the interview, but hadn't see this yet. I was also wondering, more specifically related to Paul's comment above, what the real role of audience etiquette was in classical music, so I asked the community. (You can read that here if you're interested.) The conversation that ensued was interesting, and it bolstered my support for Harvey's comments. When it comes down to it, Paul Brownsey is right. But, he's only right based on a certain set of assumptions. I think those assumptions should be challenged. I think Harvey is getting to a deeper level, suggesting that we should (in some cases) stop expecting "to listen to music an not be disturbed by others." Thanks for this post (now that I know about it, I linked to it in the relevant post on my site). What are the assumptions on which my comment was based, and why should those assumptions be challenged? I don't much care one way or another about applause between movements, but many of the other objectionable phenomena here derive to a considerable extent from lack of consideration for other people; derive from the idea that if *I* fancy chatting or eating or singing along or snogging in a concert hall, then I am entitled to do so, and if other people don't like it (other people who have paid good money to listen to music, not to me), then that is 'their problem'. It's the same mentality that insists that if you don't like the noise of my 2 a.m. parties throbbing through the wall, that's 'your problem'.